I have an album called Berstein Candide. All of the songs have Bernstein: Candide, operetta in 2 acts (Scottish opera or final revised version) - . I would like to remove the whole long version, but it seems to offer to remove only the short version. How can I edit the text to remove? can you please elaborate what exactly you are doing with beaTunes? Are you using the inspection facility? Perhaps post a screenshot that illustrates the issue? I was planning to rename them in the Finder, but was warned that that would confuse iTunes. I have a number of albums which, when I play them on my phone, show only the Album name, not the track name. 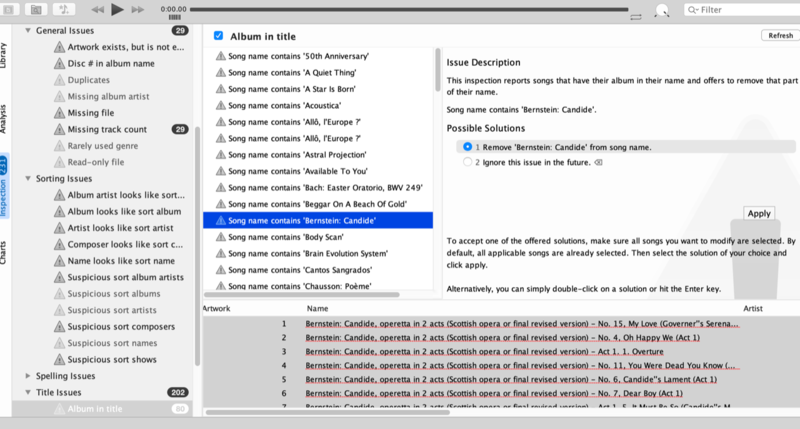 It is easy to remove the “Bernstein Candide”, as that is what the album is called, but not the rest. I tried renaming them in iTunes so the album name was the long version, but beaTunes didn’t notice. Is there some way to get it to retest one folder? Refresh didn’t do it. I was planning to rename them in the Finder, but was warned that that would confuse iTunes. I tried renaming them in iTunes so the album name was the long version, but beaTunes didn’t notice. Is there some way to get it to retest one folder? Refresh didn’t do it. Did you try File -> Synchronize? Thanks. I ended up deleting Candide, thinking I could get it again from Apple Music, but it’s not there. Hmm. Never mind. My collection is all tidy now. Thanks. hendrik closed this discussion on 29 Jan, 2019 07:00 AM.